Dolina Suchej Wody, the "Valley of dry waters", after the identically named stream (and well-named; the water goes underground in some sections with limestone ground), is perhaps the hardest valley to cycle in the whole Tatras, Polish and Slovak. This valley lies in the part of the Polish High Tatras. Only 6km of cycleable part, but a lot of time is required. The end of this valley is the "Dolina Gąsienicowa", a wide glaciar valley in which many mountain lakes are lying. But this upper part of the mountains is for hiking only. 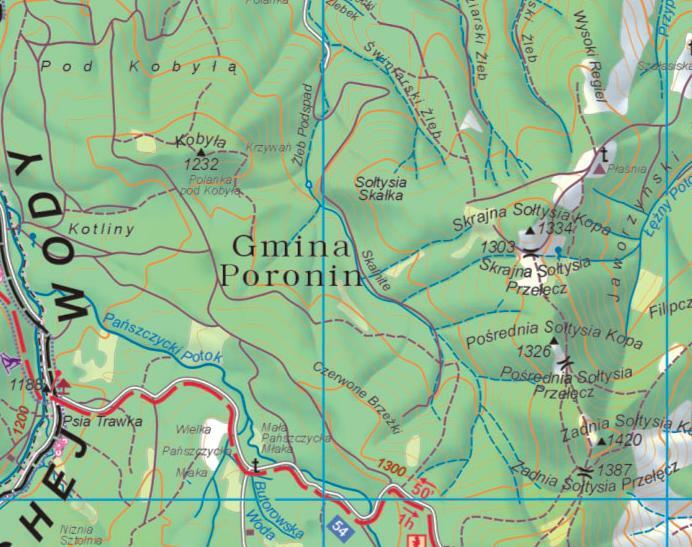 In the end of Dolina Suchej Wody is located the famous mountain-hut Murowaniec, in whose storage local it is possible to leave the bike. Dolina Suchej Wody by bike is in fact an excellent way to make a one-day trip to the highest tops of the area without spending a too long time in the approach.. in the only condition to have the required physical condition ! The first meters of this trail give a sympathic impression, but soon it turns into a nightmare. The flat track gives place to a track cobbled with horribly big round granit stones (probably taken from the nearby stream when it was built); very prominent, and very uncomforable, to cycle. The whole track requires good technical skills in order to keep the balance and cycling straight, without stepping down. If you started cycling with a polar jacket and long lycra trousers, you can remove them. For your information, there is 500m of elevation difference over 6km, on this type of ground. If you already feel like making a break, don't. The most stops you will make, the hardest it will be to start again properly, and maintain the balance on the bike. The only generous section is located half-way, a bit after the juntion with a red-marked trail (an identically cobbled track leading to Rusinowa Polana, but forbidden to cyclers). For about 1km the trail goes horizontally, and the cobbles disappear. But the break is short. The slope gets steep again, and you pass a campsite surprisingly located here, "Rąbaniska w Dolinie Suchej Wody", which is in fact a base for rock-climbers affiliated to the Polish Mountaineering Club (PZA). If you are member of any UIAA affiliated club you can sleep here, but if you ride this trail you are probably no carrying a tent on the bike..
Later is another of the worse sections of the trail, when it describes a "S" bend, with the most inclinated slope, of the whole trail. Keep going... Not long after the track is flattening a bit, before the final assault to the destination, the hut Murowaniec. The last meters are really hard, but you are well rewarded. The fresh air of the high altitude (we're 1500), and the smell of mountain pines will penetrate the deepest of your body, and you will feel like a new man ! This hut offers all facilities (restaurant, snack bar, showers, etc). The storage local costs 2zl for 5 hours; let's say that for a standard hike to a nearby summit you are likely to pay 3zl (1€), more than reasonnable. When I did it, I was loaded with side pockets containing my hiking shoes. It took me about one hour and half to achieve this ascent by bike. The way down is not much quicker. Unless you have a suspended bike, which will certainly make the way down more comfortable, you can be sure that a good hour will be required to deal with all the irregularities of the terrain. From time to time, flat sections located aside of the cobbles make it easier, but never for very long. As a conclusion, to counteract a bit the scary description of this trails, here are few views of the Gąsienicowa valley which you can admire in the end. Some old barns are located around there, and make a fine sightseeing if you don't feel climbing a mountain after that. Near the juction with the road to Murzasicle, some 200m east, in the middle of a lnog straight line in the forest, is discretely located the beginning of a cobbled land-rover trail, marked with black hiking signs. The place is a bit unpractical to park a car with no space on the sides of the main road, but you can park in the nearby village of Cyrhla, for example on the wide space in front of the village's Cars garage, on the main road.